KIEV, Ukraine -- - Ukraine has violated the terms of a $3 billion Russian loan but Moscow has not yet decided whether to demand early repayment, Russian Finance Minister Anton Siluanov was quoted on Saturday as saying. 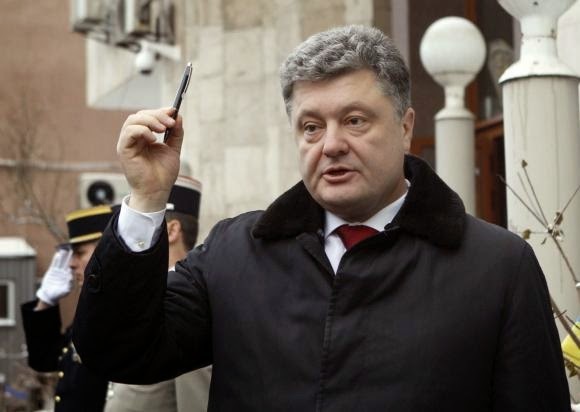 Ukraine's President Petro Poroshenko holds a pen as he honours the victims of the shooting by two Islamist gunmen at the Paris offices of the satirical French newspaper Charlie Hebdo, outside the French embassy in Kiev January 9, 2015. Russia lent the money in December 2013 by buying Ukrainian Eurobonds, two months before Ukraine's then-president, the pro-Moscow Viktor Yanukovich, fled the country amid mass protests against his rule. The terms of the loan deal included a condition that Ukraine's total state debt should not exceed 60 percent of its annual gross domestic product (GDP). Last month, rating agency Moody's estimated that Ukraine's debt amounted to 72 percent of GDP in 2014 and would rise to 83 percent in 2015. It also said "the risk of default is rising". "Ukraine has definitely violated the terms of the loan, and in particular (the condition) not to increase its state debt above 60 percent of GDP," Russia's Siluanov said, according to Interfax news agency. "So Russia definitely has the right to demand early return of this loan. At the same time, at present this decision has not yet been taken." Siluanov was commenting on earlier remarks by an anonymous government official saying that Russia was likely to demand early repayment as Ukraine had violated many of the loan terms. Last November, President Vladimir Putin told German media that Russia did not intend to demand early repayment of Ukraine's debt as this would trigger the financial collapse of the former Soviet republic. The Russian finance ministry was not immediately available on Saturday to comment on the reports. The Russian remarks on the debt come ahead of key peace talks to resolve the conflict in eastern Ukraine and may be intended to increase economic pressure on Kiev with a view to influencing those talks. Almost 5,000 people have been killed in fighting between Kiev's forces and pro-Russian rebels in eastern Ukraine since last April. The foreign ministers of Russia, Ukraine, Germany and France will meet in Berlin on Monday to discuss the conflict, with a summit between the four countries' leaders in Kazakhstan provisionally scheduled for Jan. 15. The comments on Ukraine's debt also followed a downgrade overnight of Russia's credit rating by Fitch, underscoring Moscow's own deteriorating finances. Russian agencies cited an anonymous government official on Saturday as branding the Fitch downgrade "politically biased, not partner-like and economically absolutely unfounded". If I owed a lender some money and the lender burned down my business, making it impossible for me to repay, I doubt very much whether any court would support the lender's claim of default or violation of loan terms. The cost of the war to Ukraine that Russia started and the value of the real estate that it has already stolen from Ukraine far exceeds $3 billion. Perhaps Ukraine should simply charge this "loan" off as partial payment of the losses it has incurred by Russia's actions.